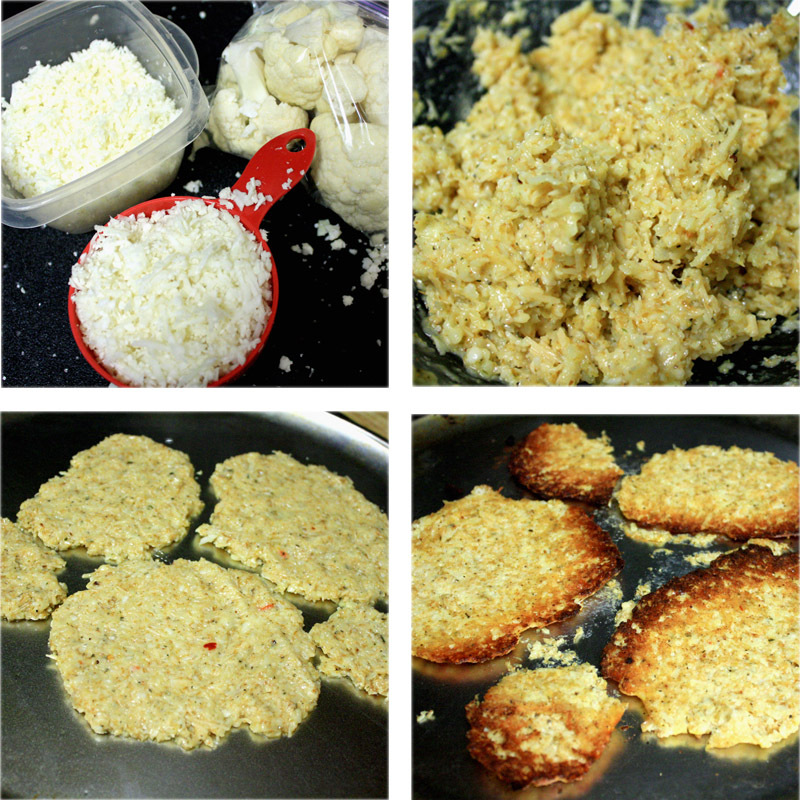 Grate cauliflower or put into food processor using the cheese grater attachment. Cauliflower will resemble rice. You can cook riced cauliflower with onions and seasonings as a side dish as well! Saute riced cauliflower on medium heat 5-7 minutes. Let cool slightly. Whisk egg. Add seasonings to egg and mix. Combine riced cauliflower, grated cheeses, and flax. One blog I read (which I forget now) made the crust in one piece but baked at a lower degree for 20 minutes, after baking it initially at a higher temperature. The verdict? 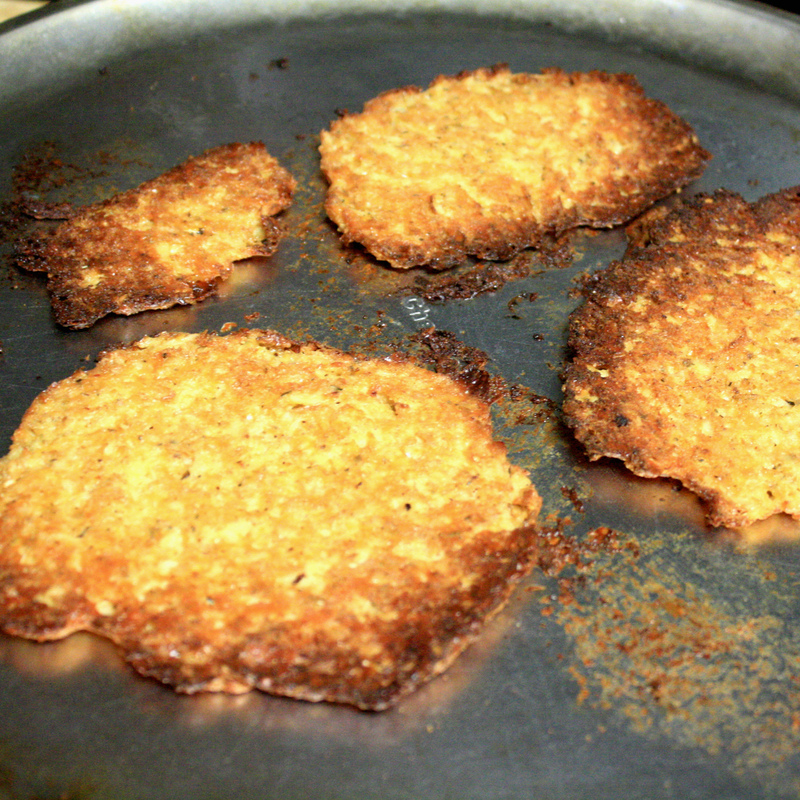 They tasted pretty good, especially the crispy edges, but what wouldn’t taste good made mostly of cheese? Then I came to the realization admitted to myself that these really weren’t healthy – especially if I was going to cover them with MORE cheese (not that I think unprocessed cheese is intrinsically unhealthy, but there is such thing as too much cheese). So I made a compromise and decided to serve these cheese cauliflower flat breads with a salad and veggies. And after eating said flat breads I felt like they were too heavy. I’m not sure why, I only just consumed almost a half of a cup of cheese *gag. I can’t imagine making this a pizza with even more cheese. Anyone else try cauliflower pizza or bread sticks?